Guy's point that you mention in the P.S. 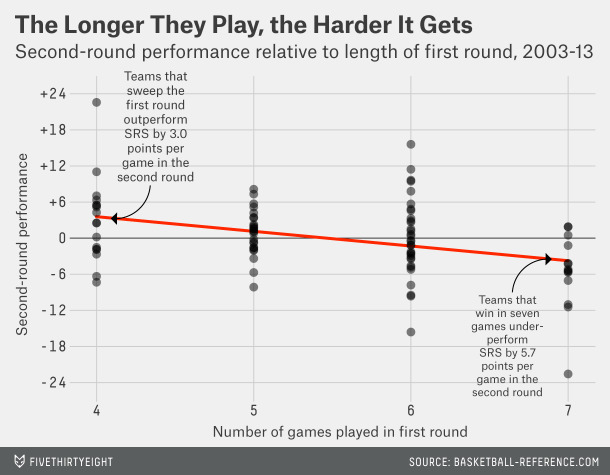 is a good one - teams tend to shorten their bench in the playoffs, and so the first round might give you relatively more information than the regular season as to the quality of a team's top players. I think the Vegas adjustment needs to be tempered a bit by the likelihood that the lines tend to be moved a bit towards favorites. I don't know if it's a half point and a full point over SRS, but I can envision it being higher in the first round and then adjusted up even more for favorites coming off a sweep.